Collard greens are highly nutritious, “cabbage-like flavored” leafy green vegetables. Collards are one of the most popular members of the Brassica family, closely related to kale and cabbage and could be described as a non-heading (acephalous) cabbage. Botanically, the greens named as Brassica oleracea L. (Acephala group). Collards probably originated in the eastern European or Asia Minor region and nowadays grown almost all parts of the cooler temperate regions. The plant grows up to 3-4 feet in height and bears dark-green leaves arranged in a rosette fashion around an upright, stocky main stem. Several cultivar types of collard greens are grown around the planet depending on the soil type, climate, etc. Blue Max: It has very attractive savoy-like blue-green leaves. Georgia: It is also known as Georgia LS or Georgia Southern. It features blue-green and slightly savoy-like leaves. Vates: Plant is compact and leaves are smooth and dark green. Champion: Low growing plant, featuring smooth, dark-green leaves with short internodes. Flash: It is a uniform Vates type with smooth, dark-green leaves. Heavy-Crop: It has very large, slightly savoy-like, blue-green leaves. Leaves have close internodes spacing so that bunching can be more difficult. Wonderfully nutritious collard leaves are very low in calories (provide only 32 calories per 100 g) and contain no cholesterol. However, its green leaves contain a good amount of soluble and insoluble dietary fiber that helps control LDL cholesterol levels and offer protection against hemorrhoids, constipation as well as colon cancer diseases. Widely considered to be a wholesome food; collards are rich sources of phytonutrients with potent anti-cancer properties, such as Di-indolyl-methane (DIM) and sulforaphane that have proven benefits against prostate, breast, cervical, colon, ovarian cancers by virtue of their cancer-cell growth inhibition and cytotoxic effects on cancer cells. Di-indolyl-methane has also found to be effective immune modulator, antibacterial and anti-viral properties by potentiating Interferon-gamma receptors. The leaves are also excellent sources of folates, provides about 129 µg or 32% of RDA. Folates play a major role in the DNA synthesis, and when given during the peri-conception period can prevent neural tube defects in the baby. Fresh collard leaves are also rich in vitamin-C, provides about 59% of RDA per 100 g. Vitamin-C is a powerful natural antioxidant that offers protection against free radical injury and flu-like viral infections. Collard greens are an excellent source of vitamin-A (170% of RDA per 100 g) and carotenoid anti-oxidants such as lutein, carotenes, zeaxanthin, cryptoxanthin, etc. These compounds are scientifically found to have antioxidant properties. Vitamin A also required maintaining healthy mucus membranes and skin and is also essential for healthy vision. Consumption of natural fruits rich in flavonoids helps to protect from lung and oral cavity cancers. This leafy vegetable contains amazingly high levels of vitamin-K, provides staggering 370% of recommended daily levels per 100 leaves. Vitamin K has a potential role in the increase of bone mass by promoting osteoblastic activity in the bone. It also has the beneficial effect in Alzheimer's disease patients by limiting neuronal damage in their brain. Collard greens are very good sources of in many vital B-complex groups of minerals such as niacin (vitamin B-3), pantothenic acid (vitamin B-5), pyridoxine (vitamin B-6) and riboflavin. Further, the leaves, and stems compose adequate amounts of minerals like iron, calcium, copper, manganese, selenium and zinc. fresh, raw, values per 100 g.
Although fresh collard greens can be available year around in the markets, they are at their best from November through April. The plant is generally ready for harvesting at 6-8 weeks after seedling. The whole plant is cut about 4 inches above the ground surface and tied in bundles. Usually, new sprouts emerge from the sides which can then be harvested again after a few weeks. In the stores, look for fresh, bright, crispy leaves with a stout stalk. Avoid those with yellow discolored, sunken leaves. Whenever possible, choose these greens from the nearby organic farm in order to get maximum health benefits. 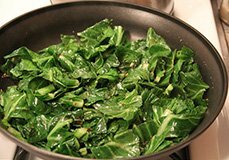 Once at home, collard greens should be cleaned as the same way as you do in any other greens like spinach. Wash the whole bunch in cold running water for few minutes until the dust, dirt rid off from the leaves and then rinse in salt water for about 30 minutes to kill any germs, cysts, and to rid off any residual pesticides. Use collards while they are fresh. Collards have relatively good shelf-life and can be stored in the refrigerator for up to four days. Both stalks and leaves are edible. Trim away tough stalks and thick leaves using a paring knife. The leaves should be chopped into smaller sections to aid in even and quick cooking. Extensive cooking may result in loss of some amount of vitamins like folates and vitamin-C.
Collards are one of the favorite greens employed in different traditional recipes in the Southern states. 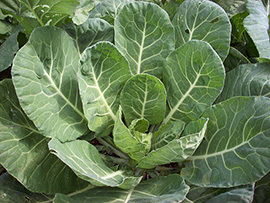 Collard greens add cabbage flavor note to the salads, cooked meat, and fish dishes. Its fresh leaves can also be juiced mixing with other complementing greens, fruits and herbs. Like other members of the Brassica family, collards may contain goitrogens, which may cause swelling of the thyroid gland. Eating raw collards, therefore, should be avoided in individuals with thyroid dysfunction. However, it may be used liberally in a healthy person. It should be used sparingly with people suffering from oxalate kidney stones. 100 g of raw collard greens carry more than 400 µg of vitamin-K well above daily recommended value; it is, therefore, should be used cautiously in people taking anticoagulants like warfarin. Medical Disclaimer: The information and reference guides in this website are intended solely for the general information for the reader. It is not to be used to diagnose health problems or for treatment purposes. It is not a substitute for medical care provided by a licensed and qualified health professional. Please consult your health care provider for any advice on medications). <<-Back to Vegetables from Collard Greens nutrition. Visit here for an impressive list of vegetables with complete illustrations of their nutrition facts and health benefits. Unversity of Illinois Extension- Watch your gaden grow..